Notes: Tonight’s pizza was an experiment on two fronts. First, it was my first time making pizza in a gas oven. And second, I used vegan cheese for the first time. I pre-baked the dough on a pizza stone for five minutes at 480 degrees. Then I topped the pizza with organic veggies and vegan cheese. I was worried the crust might get too crispy before the cheese could melt, but after ten minutes the crust was ready and the cheese was bubbling. My vegan veggie pizza was delicious. I am happy with my new gas oven and plan to experiment with some other vegan pizza recipes so check back soon! 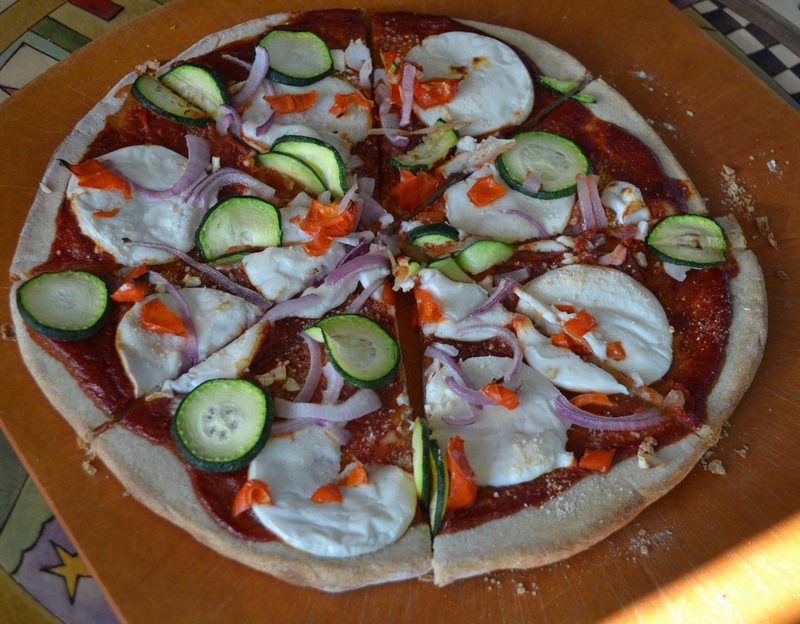 This entry was posted in cheese, Dairy-free, Onion, peppers, pizza, pizza sauce, sauce, Seasonal, squash, Summer Recipe, Vegan, Vegan cheese, vegetarian, veggie, zucchini and tagged Vegan cheese, vegan pizza. Bookmark the permalink.